Born at Leamington, Ontario on 22 August 1871, son of Alexander G. Harris and Sarah M. Williams, he was educated at Forrest, Ingersoll, and Parkhill before attending Victoria College at Cobourg from 1888 to 1891. He came to Manitoba in 1891 and taught at Elgin School to mid-December. He then attended a ten-week training course for teachers at Virden under the supervision of S. E. Lang. He then taught at Mayville School from March to December 1892 and at Binscarth School from January to December 1893. He returned to Toronto in 1894 to attend Victoria College, now affiliated with the University of Toronto. Graduating in the spring of 1895, he came back to Manitoba and, after a stint at the Central Normal School, he served as Principal at Virden School (1896-1900) and Selkirk School (1900-1903) before moving to Winnipeg in 1904, as a teacher at the Central Collegiate. 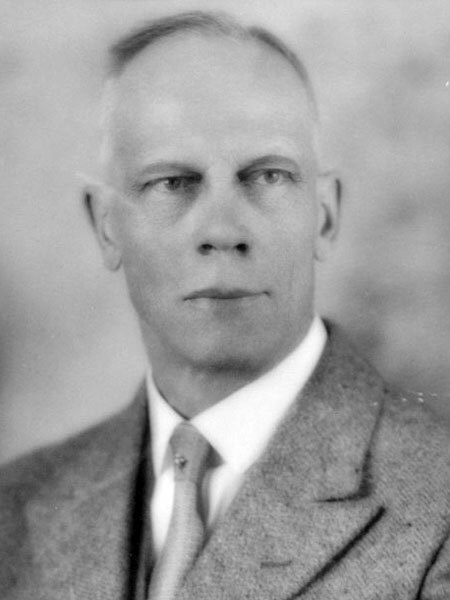 He served as Principal of General Wolfe School (1920-1923), Principal Sparling School (1923-1925), and Isaac Brock School (1925-1938), then retired from the latter in 1938. He was Secretary (1911-1920) and President (1920-1921) of the Manitoba Educational Association, and spent 14 years as chairman of a committee investigating teachers’ status and salaries for the provincial government. In the fall of 1899, he married Nina May Harding (1873-1926) of St. Mary’s, Ontario, at Virden. They had three children: George Harding Harris, Florence Ada Harris (1903-1983), and Mary Elizabeth Harris (1905-1974, wife of D. Harold Turner). He was a member of Young United Church, Masons (Prince Rupert Lodge), and IOOF (North Star Lodge). He died at the Grace Hospital on 3 June 1953 and was buried in the Elmwood Cemetery. Obituary [Nina May Harris], Winnipeg Tribune, 3 January 1927, page 18. “Personalities,” Manitoba School Journal, Vol. 6, No. 9, May 1944, page 2. “Veteran educator in city schools, Percy Harris dies,” Winnipeg Free Press, 4 June 1953, page 10. Obituary, Winnipeg Free Press, 5 June 1953, page 28. Obituary [Mary Elizabeth Turner], Winnipeg Free Press, 24 August 1974, page 45. Obituary [Florence Ada Harris], Winnipeg Free Press, 12 February 1983, page 61.